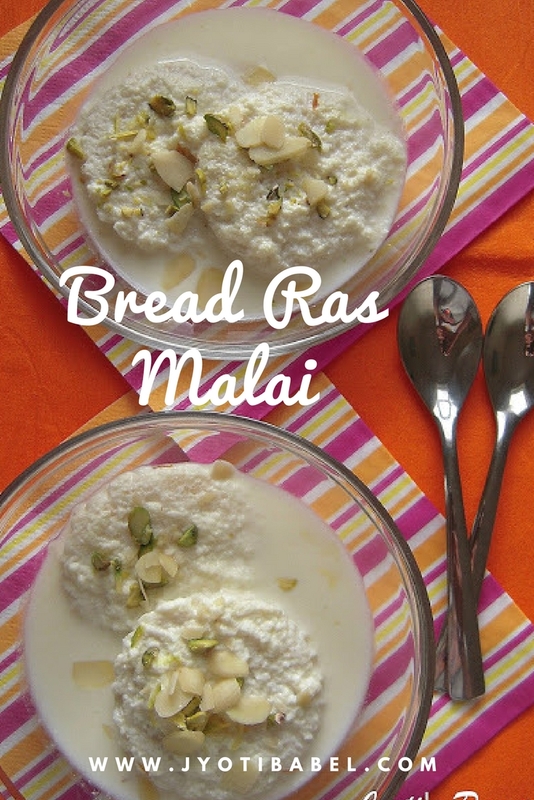 Bread Ras Malai is a cheat's version of the conventional Ras Malai we all know. It tastes as good and is comparatively easier and quicker to make. There are a few sweets I always relish. They are the ones prepared by my mother. They bring good memories from good old childhood days. No matter how much I try but I can't replicate the taste to the T. I think that's the magic of mom's hand that add a special touch to every dish prepared by her. One of them is this Bread Ras Malai. I have tried it on my own a couple of times now and have nearly replicated the taste! I am an absolute lover of Ras Malai. I can unabashedly gorge on it. As a child, I was not very big on sweets, but for this sweet dish, I would never say 'no'. But, having Ras Malai was a pleasure which I enjoyed only in restaurant or in a wedding party until my mom came up with this version. Its best to use white bread for this one as wheat bread won't really taste that good. 4 tbsp sugar or to taste. 2 cardamom pod seeds crushed. Almond and pistachios flakes to garnish. 4-6 Slices of good quality white bread. 1. In a tablespoon of milk add the saffron and set aside. In a non-stick deep pan boil rest of the milk. When it comes to a boil lower the heat on medium and let it simmer till it is reduced to about 3/4th of the original volume, stirring at small intervals. It will take about 10-15 minutes. 2. Now stir in the sugar and stir. Add the saffron and cardamom and let it simmer for another 5 minutes. 3. When the milk reaches the desired consistency turn off the heat and let it cool down to room temperature. Refrigerate it till needed. 4. Using a cookie cutter, cut out rounds off the bread slices. One large slice will give 2 pieces of bread. Place them in the serving bowl and pour cold prepared milk mixture over it. Garnish it with almond and pistachios flakes. 5. Let it sit for 5 minutes so that the bread pieces soak in all the flavours from the milk mixture. Serve chilled. 1. Check the sweetness of the milk mixture before adding all the sugar and adjust according to your taste. 2. For a thicker consistency, cook it for a little longer. 3. It is always better to prepare this dish while preparing daily meal. Only making this might seem tedious and time taking. I always put it on one of the burners and by the time I am done with rest of the cooking, it is ready. A bowl for you too! Enjoy! 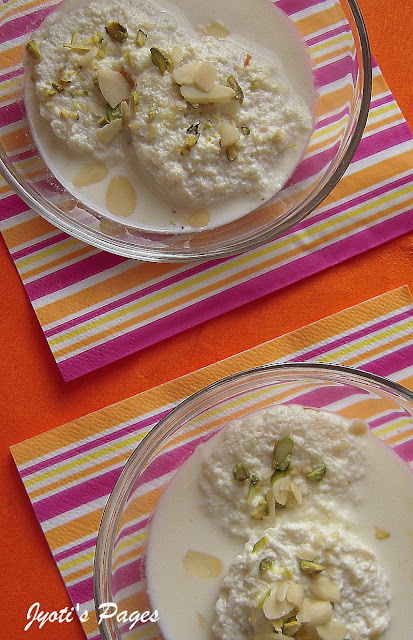 This is such a easy breezy recipe for Ras malai..bookmarking this. This is so inviting and your pics are just worth drooling ~ yum! Yummy! and innovative.. best part is it seems so easy .. Bookmarking this recipe..
yummy! time to try this recipe. Thank You guys for the lovely comments!It makes my day! Ras Malai, one of my fav sweets. Look delicious and yummy. Yummy! On my list to try it out and surprise my family with this one! Thanks for sharing Jyoti. bread rasmalai looks awesome. so inviting and mouth watering. find it a quick fix to make ras malai. loved it.